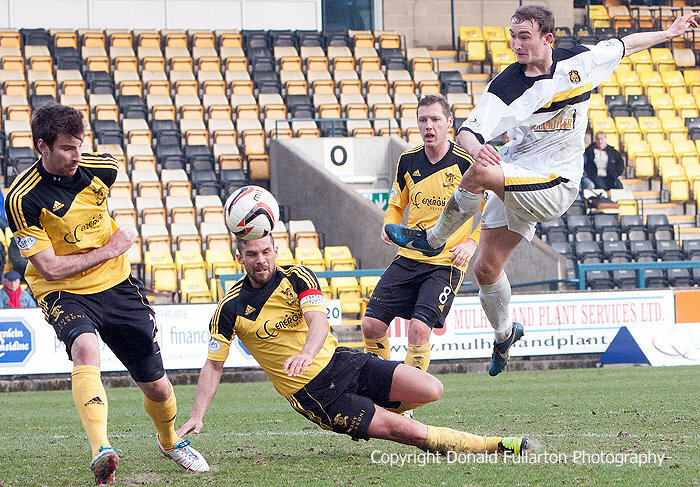 DUMBARTON took all three points against Livingston at Almondvale thanks to a late brace of goals. DUMBARTON took all three points against Livingston at Almondvale thanks to a late brace of goals — and moved level with them in the SPFL Championship. In front of nearly 1,000 fans, John McGlynn's Livi Lions had the better of the first half, with Colin Nish passing up a hat-trick of chances and Chris Kane sending an overhead kick over the bar. They took the lead on 26 minutes when the unmarked Nejc Mevlja netted with a header from a corner, giving keeper Jamie Ewings no chance. Dumbarton manager Ian Murray was sent to the stand for dissent at half-time, but after the break his side shook off their early lethargy and gradually took command. But it took a red card incident when Sons full back Paul McGinn was felled by Livi captain Jason Talbot to ignite a late burst from the visitors in the final eight minutes. First Chris Turner netted from the penalty spot when the referee spotted a jersey tug on Chris Kane, and then the young on-loan St Johnstone striker was in the right place to score the winner when a Garry Fleming shot was only parried by the keeper. The picture shows an earlier shot from Chris Kane.